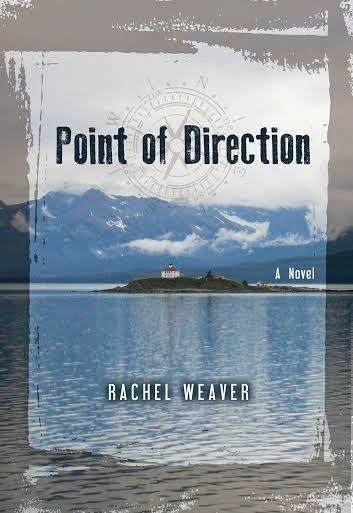 Rachel Weaver’s literary fiction, Point of Direction, (ISBN : 978-1-935439-91-2, 233 pages) was released May of 2014 by Ig Publishing to rave reviews. Oprah Magazine described it as a “strikingly vivid debut novel.” In his review on NPR’s All Things Considered, Alan Cheuse described the novel as one that “pulls you in.” Point of Direction was chosen by the American Booksellers Association as a top ten debut for Spring 2014, by IndieBound as an Indie Next List Pick, and by Yoga Journal as one of their top five suggested summer reads. Hitchhiking her way through Alaska, a young woman named Anna is picked up by Kyle, a fisherman. Anna and Kyle quickly fall for each other, as they are both adventurous, fiercely independent, and in love with the raw beauty and solitude of Alaska. To cement their relationship, they agree to become caretakers of a remote lighthouse perched on a small rock in the middle of a deep channel—a place that has been uninhabited since the last caretaker mysteriously disappeared two decades ago. What seems the perfect adventure for these two quickly unravels, as closely-held secrets pull them apart, and the surrounding waters threaten uncertain danger. Set against the uniquely rugged landscape of coastal Alaska, Point of Direction is an exquisite literary debut. About the Author: Prior to earning her MFA in Writing and Poetics from Naropa University, Rachel Weaver worked as a biologist for the Forest Service in Alaska studying bears, raptors and songbirds. She teaches fiction at Lighthouse Writers Workshop in Denver. Her website is: www.rachelweaver.net. What is Your Sweet Success Story? Do You Love Me? Do You Really Love Me? Exotic Dancers and Free Beer!